Select the background you would like for your product photos (flat white or reflective white) and how many photos you need. Be sure you select “single product photography” for individual items, and “group product photography” when you have a grouping of more than one item for each photo. Ship your products to our studio in Orlando, FL. You can send us a pre-paid return shipping label or be invoiced for your return shipment when the project is complete. We shoot your products on your selected background and make sure your products look stunning. Within 14 days of receiving your products, we will send you a gallery of high-resolution images to download for your business needs. A: For each product, we will provide 1 photograph. 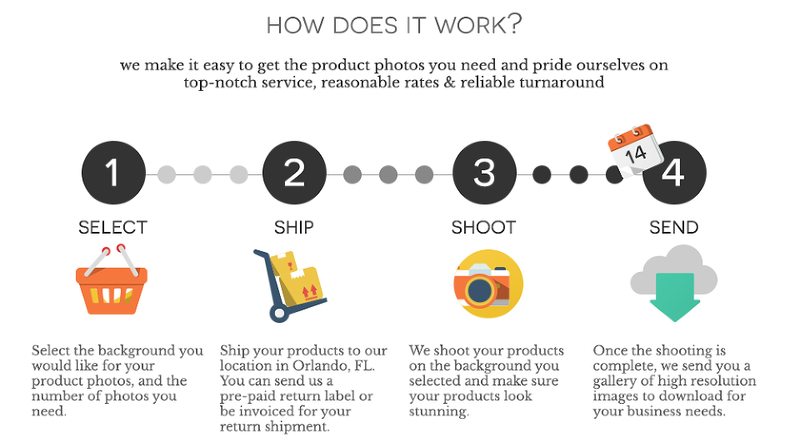 If you need more than one photo for each product, simply purchase additional shots! Each photo will receive basic retouching and color correction, and the background will be set to 255 255 255 (pure white) around the product. Retouching for product flaws or defects will be an additional fee. Q: What’s the difference between “single product photography” and “group product photography”? A: With single product photography, only one item will appear in each photo – this does include matching pairs, i.e. earrings, left and right shoes, etc. For group product photography, we can arrange multiple, different items (usually overlapping) for a single photo. Q: What if my products are larger than 2 feet? A: For larger products, please contact us for a custom photography quote. Q: How do I let you know what kind of photos I need? A: Once you place your order for your products, we’ll send you a brief email questionnaire that will help us understand what kind of photos you need. Q: Can I send you examples of what I’d like the photos to look like? A: Absolutely! You’ll have the opportunity to do so when you receive our email questionnaire. The more details, the better! Q: Can you include props in the photos? A: Unfortunately, no. In order to keep our prices low and turnaround times fast, our setup must be consistent. If you’d like props included in your photos, please contact us for a custom photography quote. Q: What about different backgrounds? A: At this time, the only standard backgrounds we offer are flat white or reflective white. If you’re looking for other solid colors or something more environmental, please contact us for a custom photography quote. Q: Can you do a rush order? A: For most projects, yes. Our rush turnaround time is 7 business days and is available for up to 49 products for an additional $25 per product. If you need a rush order for more than 50 products, please contact us for availability and the rush fee. Q: Will my images be Amazon compliant? A: Yes! Our photos are optimized to be accepted by Amazon according to their standards. A: We believe in unlimited usage – once you purchase your photos, they’re yours to do with as you please. No one needs the headache of licensing! The only exception is that you may not resell the images to other companies. Q: How big are the images I get to download? A: We will give you files at 300dpi that measure at least 2400 pixels on the short side. They will be plenty large for all web purposes and most printing needs (i.e. up to an 8″ x 10″ print). Q: What file format(s) while I receive? A: By default, we deliver JPG files in sRGB at 300dpi. However, we can provide TIF or PNG files at your request. If you require CMYK files, let us know. A: You may ship your products to our studio in Orlando, FL through UPS, FedEx or USPS. To expedite the return process and save money, the best option is to include a pre-paid return shipping label in your package. However, if you do not include a pre-paid return label, we will invoice you separately for return shipping via UPS, FedEx or USPS. We highly recommend purchasing insurance as we are not responsible for lost shipments. If you do not wish to have your products returned, that is fine, too. Please note: We will dispose of any unclaimed products after 30 days. Q: What if I live near the Orlando area? Can I drop off the products instead? A: In order to keep our turnaround time promise, all orders, without exception, must be shipped to us. If you have a rush order, we can arrange to meet you in the East Orlando area for drop-off and pick-up. However, meeting times must be on weekends or after 5 p.m. on weekdays. Q: Can I be present at the photo shoot? A: Our photo studio is not open to the public. If you wish to be present for a photo shoot, please have a location in mind and inquire about our on-location photo services. We offer day rates for on-location services starting at $800 for a half-day. Still have questions? View our policies for more details!